It is time to make dream real that dream of the most cyclist is cycling in Salar de Uyuni. I couldn’t cycle yesterday because of Bolivian census. 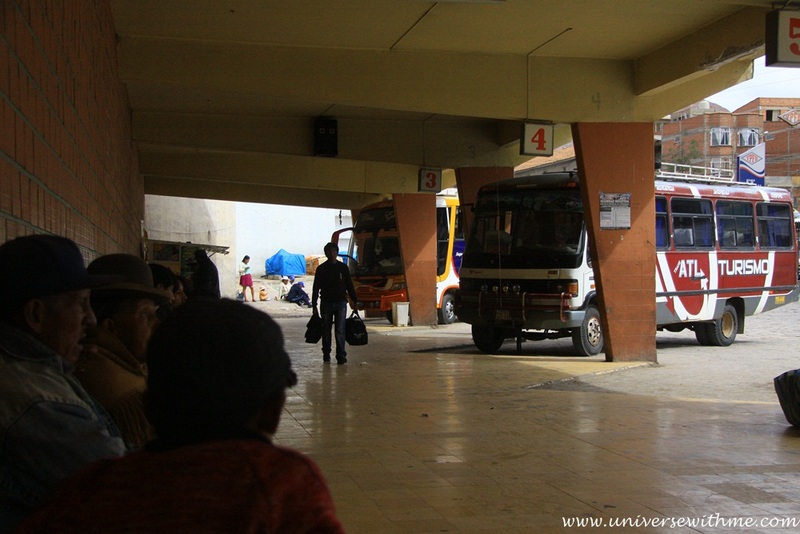 Today early morning I go to Ururo to take bus to Uyuni. But there is only one bus that it leaves at 7 pm and arrives at 3 in the morning. I heard that this route is dangerous that last year one police was killed. I don’t like arrive at 3 am in the strange city. I find other longer way that I go to Potosi. The next day, I can see many tour cars. Yesterday as arriving in Uyuni, I asked to people and heard that there is no water now in salt flat. I am so glad. I was worried about it because when I rode in the north, everyday it rained. 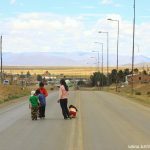 Town of Uyuni is really busy with local people. When I was in La Paz, tour company said that it was not possible to ride a bike in Salar de Uyuni becausse I will get lost. When I go to information center in Uyuni, she says it is no problem. I just have to follow track of cars. Lucky! I meet other cyclist in the town today. He asks me to cycle together. I say I am slower ever. But he says it is okay. So I decide to go to Uyuni Desert with him tomorrow. I have lunch llama hamburger. Its taste is like beef. Price is 18 Bol (2.5$). I exchange two books in tour company in the night for 20 Bol (3$) and buy some food for cycling. I go to Pc cafe for uploading journal. I sleep after 1 am. Every day there is much to do for tour. The next day finally it is time to make dream real. It is funny that town of Uyuni is far from entrance of salt flat. Colchani is entrance of town for salt flat and it is 25 km (15 mi) from Uyuni. I think town of Uyuni is popular because of not only bigger city, but also name of the town. It is really bumpy and unpaved road to Colchani from Uyuni. I buy water of 8 L in Colchani. Actually it seems that there is two ways to cycle in Uyuni. The first one is going to Chile way and the other one is round trip. There is Korean president election on December that I must do this one, because Korea is democratic country that I never want to give up my right. I was looking for Korean embassy in one of Countries in South America. I also have to go to Brazil to take flight to Africa. So I decide to go to Paraguay for election. It means I have to come back to Uyuni town. I am not sure I will spend one night or two nights in Salar de Uyuni so I buy 8L water and also some snacks. Now I can see Salar de Uyuni. The mount looks like Island in the lake. It is my first time to ride at the long unpaved bumpy road so that bottle of water is dropped down a few times. I see some sign of hotel. It is not salt hotel what I expect. It is really fancy and nice. Reception says it is 57 for one night. I ask him it means 57 Bol (7$). But he says it is 57 $. Finally I am on Salar de Uyuni. It is wet around entrance. No dry season? 90 % of those are for the table and 10% of those are for the animal. 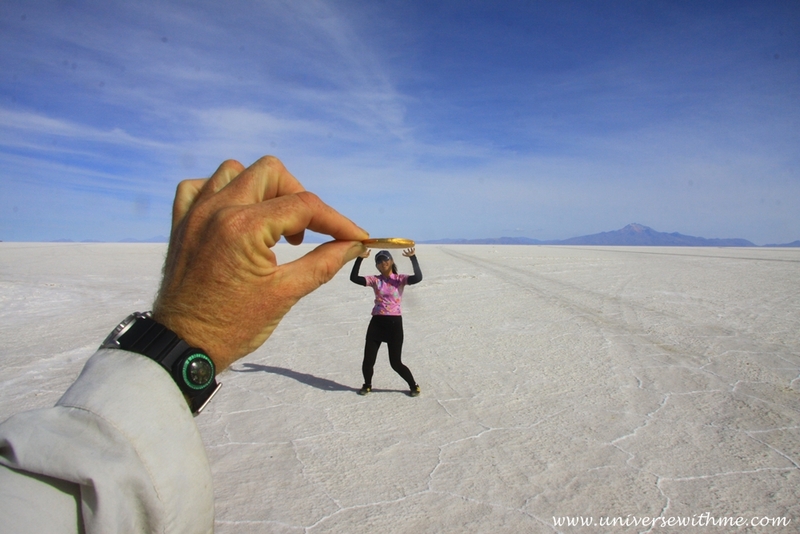 Bolivian can eat salt for thousands years from Salar de uyuni. Actually I don’t ride with him. He is speed at 15 km (9mi)/h. I am speed at 10 km (5mi)/h so that he always goes faster and I could not see him on the road. I see only him when he takes break time. It is entrance of salt flat. It is 8 km (5 mi) from entrance to salt hotel. Salar de Uyuni is located at altitude of 3,600 m (11,811 ft), but I am used to high altitude already because I have cycled in Andes. Many flags are broken because of strong wind. It is salt hotel and 150 bol (21$) for one night. It is built with salt. It is only life I have seen in Salar de Uyuni. I think it is dying. Many tour cars go the same way that I can follow their way. They look now like birds. The road is kind of bumpy, but not too bad. I need to cover all my skin for protecting. When I take the break, I meet Venezuelan guys who are running. They say they will run 44 km (27 mi) today. What awesome guys! I think the truck is going to Chile way because car has many things on the top. There are many holes. I think it makes car accident. At least 16 people, including 13 tourists, have been killed in jeep accidents on the Salar de Uyuni salt plains since May 2008. I think people have to be careful when they choose tour company. It would be good for spend more money to choose better company in Uyuni. It is so interesting place. There is too strong head wind which makes my tonsils swollen. I have really weak tonsils so that strong head wind is bad to me. The sun starts going down. I couldn’t see him for a while. I am not sure that over there it is Incahuasi which is my destination. Sunset in Uyuni. It is so beautiful but I have too much pain with tonsils that wind is stronger now. I think this Island is what I am looking for. As reaching Island, I find it is really wet. I am not sure how I can sleep tonight. I meet him at the Island. I set up my tent after asking permitting to office. This Island has owner I think. He decides to sleep in the hostel, because he has long journal to Chile. When I finish putting my tent, it is around sunset. I can’t believe that I am in Uyuni which is dream place. I cook something but too much wind makes it hard. Overhead, there is too bright moon. I have the program that I can see what time the moon goes down. I make alarm around 3 am. But I wake up around 2 am, because I am too sick with tonsils. I take pills of aspirin and other thing for cold. I can see Orion and other constellations on the sky from my tent. I love it so much that I lie down and look those things. And…And..And… I fall asleep while opening my tent….When I wake up around 5 am, the stars already hide to the sun. I am so sad that I couldn’t take the picture. But actually it was not special; I’ve seen the night sky so many times. It was another night sky. I think the amazing night sky picture is taken with amazing technically that we can never see those on naked eyes. Anyway still I love looking at the night sky. The next day I have the time to be relaxed, but too many tourists are on the Island that I leave earlier than what I expect. He has to go to Chile way and I have to go back to Uyuni. We take some funny picture each other. The last one is the planet with apple. The volcan is called Tunupa. I don’t know why it is wet around Incahuasi. I take the picture by myself with tripod. It is really bigger hole and deeper. I have pain with tonsil that I take another pills. It is so funny that when I go back, wind blows over the back. Today is really easy day. I lie down on salt flat. I can never hear any sound. Salar de Uyuni swallows sound of the world. The shadow is longer two times a day. In the morning and in the afternoon. I’ve realized this true every day on the road. Today is really sad to see my longer shadow. It was my dream to come to Uyuni and it is almost time to leave my dream. I set up my tent near the salt hotel. Actually it is illegal to build anything on Salar de Uyuni, so I don’t ask permit to owner. It is really my first time to set up my tent without permitting. It is the same as yesterday that too much wind is in the night. There is really interesting thing that wind is gone around midnight. Today is really cold night. I think yesterday it was not much cold because of cactus. I make alarm to wake up after the moon goes down, but I wake up earlier because I am too sick that I throw up. The moon is going down. It is the only one I take the picture of stars. Yeah, not every day I can make picture of the night. The next day I try leaving early to avoid crash of tourists. I brought all my stuff when I left the town, because I didn’t have plan to stay one more night in Uyuni town. But right now I have no choice that I am too sick. I try hitchhiking, but there is no car. I lie down on the salt flat. There is no sound. No wind, No birds, No cars, No people, Nothing on the salt flat. It is my first experience that I hear nothing in the world in my life. I fall asleep a little bit without hearing any sound. Interesting things happens that I get better after sleeping a bit on salt flat. I go to Uyuni town without anybody’s help. It was easy to go from Uyuni town to Colchani. But it is hard to go back. I think it was kind of downhill to Colchani. Today it is really bumpy that my hands are too much shaked. Actually I bought beer yesterday night in Salt hotel, but I was too sick to drink. Tonight I will drink it with celebrating. I find big problem that I have burn on my ears. I forgot to cover or use cream for my ears. I feel like somebody hits my ears. Cycling in Uyuni’s planet. It was for two nights and three days in Uyuni. Although I was sick, I was the happiest person in the world that I made my dream real. The next dream is to cycle in Africa. I am not sure that how I make it. Always there is fear to make dream. But I always try to believe I can make it. It is time to make other dream real. Video of Cycling in Uyuni. I made it! But there is other option like round trip or something other way if you have confidence that you will not get lost. Remember that if you go out of the main road, you will have been dangerous. – Need Long gloves. I have six holes on my groves’ finger that it is really comfortable for Ipod. But after riding in Uyuni, I have too pain with six fingers because it was too dry that bleed. – Make sure cover your all skin from the strong sun and reflection. It is an altitude of 3,600 km. – It was okay to sleep at Incahuasi, but the second day it was too cold to sleep on the salt lat. Although I caught terrible cold, it was not below zero. There is two ways that the first one is to go to Chile and the other one is round trip. – One full day tour is around 150 Bol (21$). – I saw info that there is only one ATM in Uyuni. But I saw at least over three ATM in Uyuni now. – Hostel will be around 5~7 $. 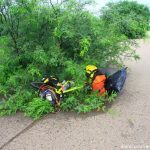 – It is rainy season from December to March so that backpacker will love touring at that time, but not for cyclist. “57 $” – they said at the hotel… wow… even in the middle of the salty desert they’re pulling tricks. At least they didn’t say 59.99 $. yeah it is not 57.99 or 58.99 hahaha..